The propaganda posters, letters, guns and even the clothing of the time is on show. A NEW EXHIBITION looks at the stories of 21 Irish men and women who were involved in The Great War. Recovered Voices – Stories of the Irish at War 1914 – 1915, opened at the National Museum of Ireland yesterday. It examines why Irish soldiers chose to join the British Army and what happened next – remembering that more than half of them were dead by Christmas 1914. Irish people were involved in the war as recruits, doctors and nurses while many women supported the war effort by working in shell factories in Ireland. It showcases clothing belonging to well known Irish men including a blood stained shirt belonging to James Connolly and a coat belonging to Michael Collins. Irish emigrants also fought in the Canadian, Australian, New Zealand and South African Armies and some fascinating clothing choices are also exhibited – including this helmet worn by an officer of the Bengal Horse Artillery around 1845. In conjunction with the exhibition ‘Pals – The Irish At Gallipoli’ will be performed at the National Museum of Ireland at Collins Barracks from next month. Producer Matthew Smyth, says ”PALS delves into historical events of WW1 with both scalpel like precision and dreamlike intensity”. Minister Heather Humphreys said: “The Irish experience of World War 1 was complex and varied. Through a series of personal stories, this exhibition highlights how Irish men and women were involved and brings to life the difficult choices and extremely harsh conditions they faced throughout 1914 and 1915. The show will run from February 3 to April 30. Email “Photos: The Irish at War - stories of 21 Irish men and women brought to life”. 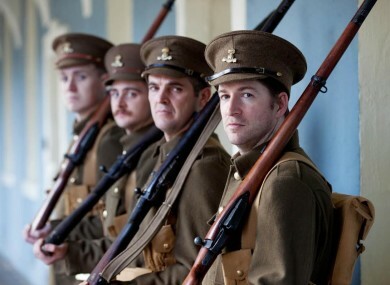 Feedback on “Photos: The Irish at War - stories of 21 Irish men and women brought to life”.